Railpictures.ca - Mike Molnar Photo: An SOR local heads back to Hamilton Yard after working various industries around the industrial area of Hamilton. 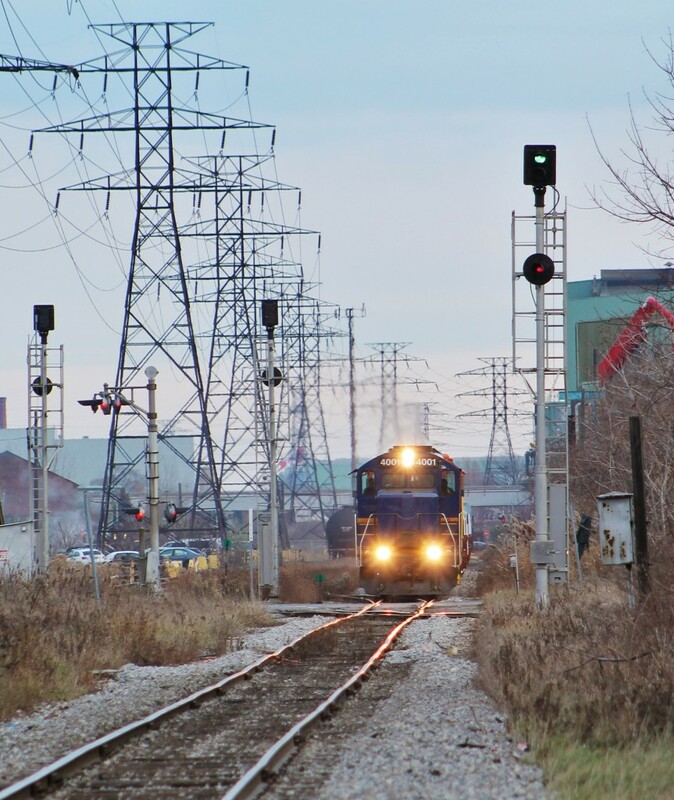 The signals in the shot are for the diamond between CP and SOR at Gage Ave. They operate on a first come first serve basis. Basically, the signals are always green for all directions. When an approaching train reaches a certain point before another does, it will have the right of way through the diamond and all other signals will drop to red. Other trains have time to react to this because they’re going at a speed which allows them to stop within half the distance that they can see. This is why the signal facing the camera is still green even though there is an obvious obstruction on the track ahead. I believe these signals are called ABS signals but feel free to correct me if I’m wrong. Pretty soon though shots of SOR here won’t be possible with CN taking over operations in this area on December 18th. | Railpictures.ca – Canadian Railway Photography – photographie ferroviaire Canadienne. Caption: An SOR local heads back to Hamilton Yard after working various industries around the industrial area of Hamilton. The signals in the shot are for the diamond between CP and SOR at Gage Ave. They operate on a first come first serve basis. Basically, the signals are always green for all directions. When an approaching train reaches a certain point before another does, it will have the right of way through the diamond and all other signals will drop to red. Other trains have time to react to this because they're going at a speed which allows them to stop within half the distance that they can see. This is why the signal facing the camera is still green even though there is an obvious obstruction on the track ahead. I believe these signals are called ABS signals but feel free to correct me if I'm wrong. Pretty soon though shots of SOR here won't be possible with CN taking over operations in this area on December 18th.